Hey ho, it’s been a wee while, hasn’t it? Never mind though, I’m back with a finished skirt that’s only been a work in progress for 4 years! When I was living in Berkeley, back in the days when I still used Pinterest, a stylish friend of mine pinned a skirt by a French clothing designer that I fell head over heels for. 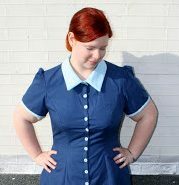 It was a circle skirt, made of woollen fabric, with two velvet bows on the front. It was also about €300 and not anywhere near my size, not that I would have bought it anyway. So I set about making my own. 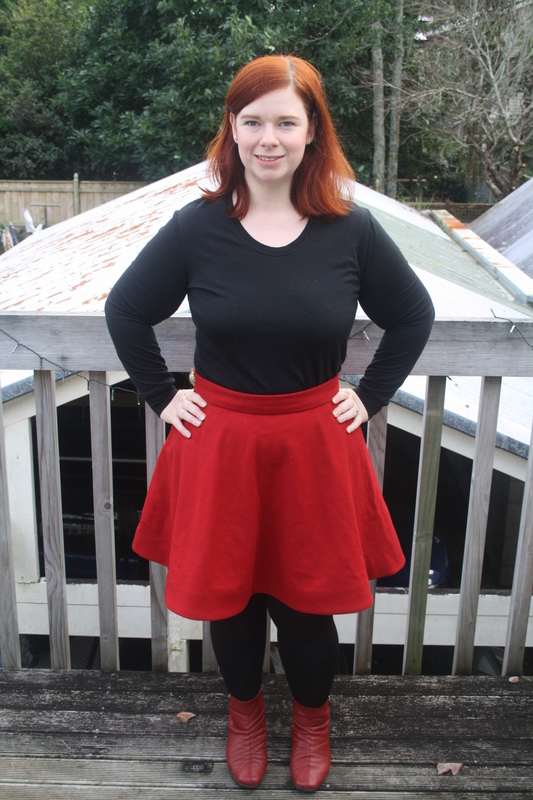 I bought some red Melton wool from fabric.com, and used the Circle Skirt App by By Hand London to make the pattern. I “pre-washed” the wool by taking it to the laundromat and tumble drying it with a damp towel – not having my own washing machine in the States was infinitely annoying when it came to pre-washing fabric! 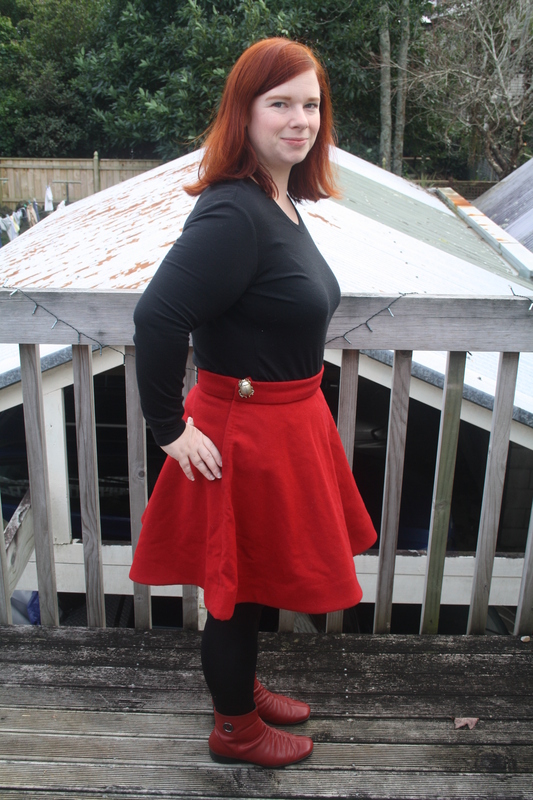 I cut out the skirt and the waistband, and then it got set aside and suddenly we were moving to New Zealand! 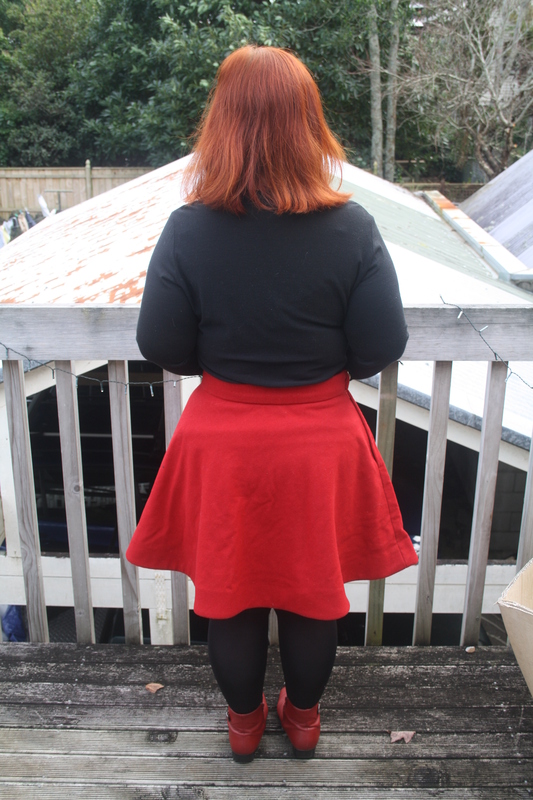 Of course, I had to bring my unfinished skirt with me, so I packed it into a ziplock bag in my suitcase and once I got a sewing machine here in Auckland, I took it out again and assessed. 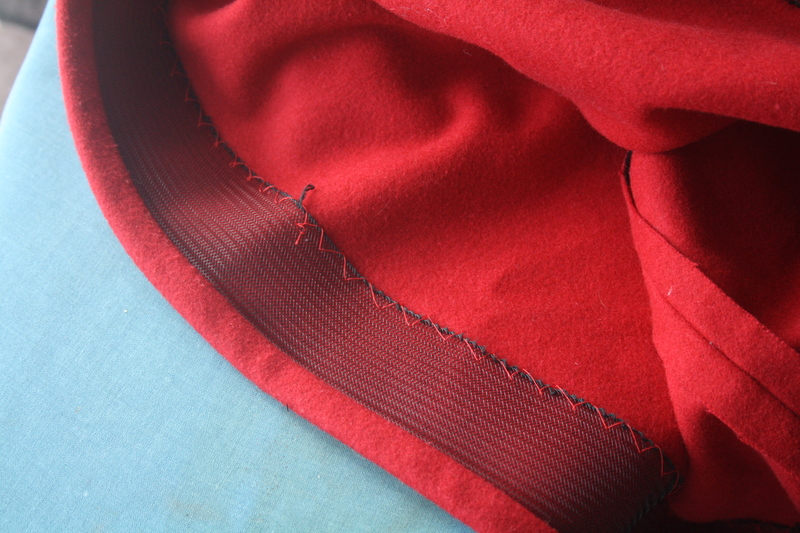 I wanted to interface the waistband, but I was unsure what to use, so I went to the local fabric shop and they sold me some quite expensive interfacing that worked beautifully, and in fact I only used the last of it up recently! I wish I knew what kind it was but the fabric store employee was unfriendly and I just wanted to leave, so I didn’t ask. It was very soft, and grey in colour, and fusible. 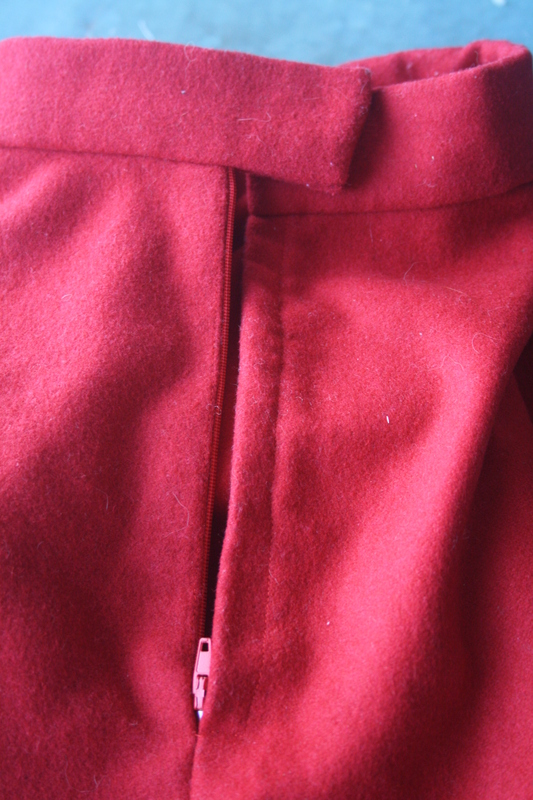 After that, I attached the waistband and inserted a lapped zip from my newly acquired op shop stash. For the hem, I knew I wanted it full and swingy. I had bought horsehair braid from the now-defunct online shop run by Sunni from A Fashionable Stitch and knew I wanted to use that. 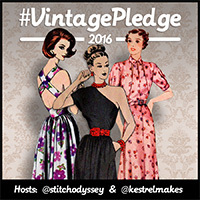 I used Gertie’s tutorial on how to attach it and shape the hem, and after folding it up I did a catch-stitch by hand to secure it. And then, I was stumped. I had bought some velvet ribbon to try and mimic the original skirt, but it was only velvet on one side and I couldn’t figure out a way of forming the bow where none of the non-velvet side was showing. The skirt ended up getting put to the side again after I got a job, and for a while I thought about it and toyed with the idea of embroidering something around the hem. For two years. I wish you couldn’t see the outline of my top under the skirt – the photographer should tell you such things! Finally, last Monday was Luke’s birthday, and he wanted to take some photos of me (among other things), and I wanted to look nice. I came across the skirt again, and decided to try it on. I wasn’t even sure if it would fit – I hadn’t ever tried it on! Thankfully, it did – but it didn’t have a button. Ever resourceful, I found a brooch Luke’s mum had given me a while back and used that to pin the waistband closed – you can see it in the side-on shot above. Oh, and the top I’m wearing? I made that, too! It’s the Ensis Tee by Papercut Patterns, made out of black merino from The Fabric Store for our Iceland trip last year. A black long-sleeved top is a must for me, and this one is really comfy. I have fabric to make a few more, just need to find the time!